Klicka här för att komma direkt till sidan. Detta är en första test för att se om vi kan locka Reining, cowhorse och Ropingryttare till Skåne. Välkomna ner till södern till en fantstisk anläggning med 2 ridhus, perfekt reining botten och med siktet inställt på att blir en av Sveriges bästa tävlingsbanor...men då behöver vi er! Inger & Mats öppnar upp restaurangen med hemlagat hela helgen. Vi säger som NRHA "Everything else is just another horseshow" och som Falstebo horseshow...våra arrangemang skall vara lika mycket tävling som fest..och därför har vi liveband både fredag och lördag med öppen bar! Klassordningen är nu publicerad MEN vi resereverar oss för skrivfel och ev tillägg/ändringar nödvändiga av olika orsaker. Anmälan publiceras inom kort. OBS! ni kan redan nu beställa box och camping. Klicka här för att komma direkt till anmälan. Nu har vi pratat med NRCHA och vi har fått showen godkänd. Nu kan du beställa box och camping till årets ballaste tävling! Vad sägs om Högklassig reining med Sponsrad sadel från Western Horsemen, Cowhorse klasser med $1000 dollar i potten, Ropingklasser med 75% payback, Ranch Sorting och Cattlepenning!! Ni förstår att det är inte helt lätt att sätta ihop en klassordning till detta MEN den kommer! Roping erbjuder klasser för nybörjare och för ungdomar, Cowhorsen erbjuder NRCHA & ERCHA godkända klasser samt allbreed klasser öppna för alla utan krav på medlemskap och MED Prispengar. Klicka här för att beställa box! För dig som vill testa på Cowhorse, Herdwork, Ranch Sorting, Cattlepenning eller andra timed events så erbjuder vi alla dessa även som Allbreed klasser UTAN krav på medlemskap eller licenser och med friare krav på betsling! OBS!! Allbreed Cowhorseklasserna kommer att ha samma regler för uttdelning av prispengar som NRCHA= du vinner pengar i Allbreed Cowhorse klasser liksom i ERCHA klasserna. LB western gör en endagars Allbreed Allround tävling 12 maj.
Klicka här för att komma till kalendern. Puhhh it´s not an easy task to report everything to all the different associations, but now it´s done and we are ready to put our teeth in the next show which for UK is the Summer Sizzler and in Sweden the SWS Challenge! Prispengar/plaketter och trofeer i många klasser både Ropeing, Reining och Cowhorse!! BOKA Datumen 18-20/5, Eugenio Latorre dömer tillsammans med James Gerdes Hansen!! Ja det blev litet men ack så trevligt, ni är guld värda som kom och jag hoppas och tror att ni faktiskt hade lika trevligt som vi OCH att ni fick uträttat det ni ville. Ann Kristin Svensson kom ända från Norge och satte ribban med högsta scoren för tävlingen stort grattis till alla placeringar. Som sagt Anna Westernridskolan som var på plats med ett helt gäng elever och givetvis ni som alltid kommer till det vi arrangerar på Hälldala, Moreno, Magnus, Ingela, Jannicke och givetvis Sofia Bengtsson som tog sig hela vägen ner till Hälldala. Henry Persson med Western Horsemen butiken, alltid underbart att ha dig på plats...och nu med alldeles irresitible nya boots och paddar!!! Och alltid lika trevliga domaren James Gerdes Hansen som engagerat och kunnigt dömde. Nu laddar vi inför Maj tävlingen SWS Challenge 18-20/5...propp och anmälan kommer ut i slutet på veckan men jag kan säga att det blir REINING, COWHORSE, ROPING, SORTING!!! Missa inte att boka upp helgen och håll utik här på sidan. Alla resultat publicerade samt scoresheeten. Lördag: Vet besiktning kl 8.30! Första klassens draw ligger ute liksom tidsplanen. Tack alla som supportat vår tävling och ett speciellt tack till Anna Westernridskolan som dragit till skåne med elever för att träna och tävla! With spring in the air and longer days just around the corner, it's time to get back in the saddle and start logging even more Horseback Riding hours. It's also a great time to brush up on your horsemanship skills. Over the next few months, join Weaver Leather endorsee Richard Winters as he guides you and your horse on a journey from the ground up. 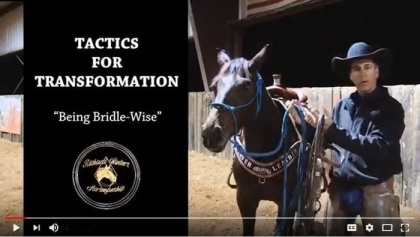 His “Tactics for Transformation” video series will start with a refresh of basic horsemanship skills and progress to saddle exercises for teaching your horse to side pass, leg yield, develop a stop and more; all while learning a more advanced approach on teaching collection. 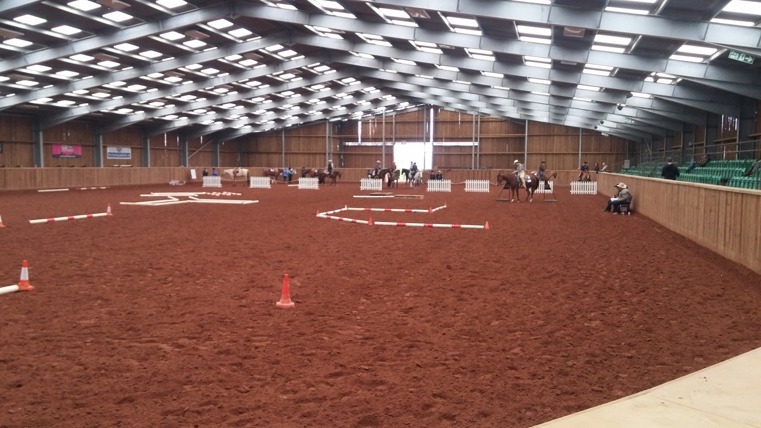 First up: Richard provides some great insight and instruction for properly preparing you and your horse to ensure every bridling is a positive experience. Watch and create your own checklist to make sure you are correctly placing your hands, adjustments, the bridle/bit and body for a safe and successful experience. This video series is brought to you by Weaver Leather. Draw för dagens klasser hittar ni här. We have had a few new exciting changes this year, two in particular that we wanted to remind all of you about! And from January 1, 2018 through 45 days prior to the European Championships, Debbie earns 8 Points in the Limited Non Pro in the same affiliate, then Debbie would technically take 10th place and would also qualify for the European Championships. So, in total, this affiliate would be sending the original Top 10 plus Debbie to make a total of 11 qualifiers to the European Championships. Starting in 2018, the NRHA Board of Directors wished to make NRHA approved classes which are $2,000 or more in added money have the prestige of being a $2,000 or more added NRHA class with all of the recognition it deserves. They passed the rule change that requires all shows with classes that have $2,000 or more in added money (each individual class) to offer the NRHA Lawson trophy. This would require show management teams to purchase these trophies and have them available for the Champions of these classes. We ask that when the show approval is sent in that it contains payment for these trophies as well as shipping addresses for them. If this information is not included, the trophies will be ordered and billed to the billing contact on the application. If you have any questions on this, please feel free to let me or your European Council representative know! Also starting in 2018, the European Nomination Conditions were updated by the European Council and the NRHA Board of Directors to have the age of European Derby horses be 5,6,7, and 8-year-olds. This means that four-year-olds will show in the NRHA European Futurity but not the European Derby in their four-year-old year. If you have any questions on this, please do feel free to speak to your European Council representative or directly to me! There have been press releases on these topics as well, but we wanted to reach out once again to help clarify! Please note if you have any questions you are more than welcome to reach out to me, your representative on the European Council, or the European Executive Board. This is a must-see for any rider or trainer competing in reining! 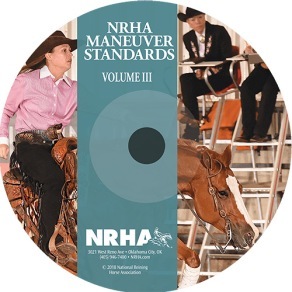 The NRHA Maneuver Standards Vol. III DVD will help you assess and understand what the judges are looking for when marking their cards. All maneuvers are featured on this DVD with examples of +11/2 to -11/2 maneuvers shown. We all know it is sometime hard to decide what color the foal is going to be with all the foal fur still in the way of the true color. AQHA has now a free live chat with a color expert...where you easy can get help...open every friday...chick it out! Click here to check what it is all about. or Immediate Release – March 7, 2018 – Oklahoma City, Oklahoma – In the fall of 2017, the National Reining Horse Association (NRHA) Professionals Committee unanimously voted to modify the nomination and voting procedures for their yearly awards. The intention of this modification is to gain more participation from NRHA Affiliates and broaden the pool of deserving nominees. The new nomination and voting process will be implemented this year and will follow the procedures below. NRHA Affiliates will submit one nomination for each of the five award categories. It will be up to each affiliate to determine how they select their nominees. Nominations for each category will need a separate form. Nominations will remain at the current due date of November 1. Once the nomination period is complete, the NRHA Professionals Committee Staff Liaison will collect and compile all nominations for the committee to review. The NRHA Professionals Committee will review all nominations, selecting the top five professionals for each category. Once the top five are selected, an electronic vote will be sent to all current NRHA Professional members. After the voting is closed, winners will be announced. Any ties will be broken by the NRHA Professionals Committee. The NRHA Professionals Committee strives to strengthen its current programs through constant evaluation. They hope this change will afford more of the industry’s best professionals the opportunity to receive the recognition they deserve through a more structured nomination and voting processes. Forms and further instructions will be available on the NRHA website before nominations begin this fall. For questions, contact Hayley Eberle, NRHA Professionals Committee staff liaison, at heberle@nrha.com or (405) 946-7400 ext. 103. Having trouble with your extended lope or the slow down from it? Or does your saddle make noice when riding...learn how to take care of it! Click here to go to Articles and handy tip page! Eight years ago, the Board of Directors voted to change the NRHA Lawson, Morrison, and Morgan (formerly known as Pewter) trophy makeup to a resin material rather than the traditional metal alloy design. The change was made in an effort to lower costs for shows, as trophy prices had increased over 50% in 10 years. Since the change, many questions have arisen about the trophies. While cost was improved with the resin material, durability in shipping was not ideal—diminishing the perceived value of the coveted awards. As a result, the NRHA Executive Committee has unanimously voted to change all NRHA trophies back to their original makeup of metal alloy after teaming up with Montana Silversmiths to offer these higher quality trophies at a better price margin than in 2010. Trophy costs will follow the scale below for U.S. orders. International shipping costs will vary. NRHA will also sell the remaining resin stock at a first come, first served basis. Resins will not be restocked once the remaining trophies are sold. NRHA understands the critical need to balance cost, efficiency, and quality within every aspect of the organization. Changing the trophies back to their original, metal alloy makeup achieves this balance while restoring a mantle-worthy award back to its original glory. NRHA members have the opportunity to nominate members to represent their interests on the NRHA Board or Executive Committee. Members can also help guide the future of reining by giving input on 2019 rule change proposals. Read the following overview for more information on how you can get involved in the process! Read through this year’s rule change proposals in the March NRHA Reiner magazine or online in the Members Only section of nrha.com! Want to share your opinion? Take the member survey by April 16 to have your opinions shared with the NRHA Board of Directors!